Even wildlife biologists have a tough time telling the difference between the endangered Hawaiian Duck, Koloa Maoli, and the common mallard. Cross-breeding or hybridization between the two species is the primary reason the endemic Koloa duck is endangered. A new collaborative program is addressing the future of the Koloa. The project attempts to provide steps which will ensure its ultimate survival as one three remaining native waterfowl species in Hawaii (Koloa, Hawaiian Goose-Nene, and Laysan Duck). The Koloa is a small duck, similar in appearance to the mallard. It is more secretive and behaves differently than the mallard. Present in the Hawaiian Islands for at least 100,000 years the Koloa ranges from sea level to an elevation of 10,000 feet. Cross-breeding with mallards began sometime in the late 1800’s when the more common mallard was imported to Hawaii for ornamental ponds, hunting and farming. The U.S. 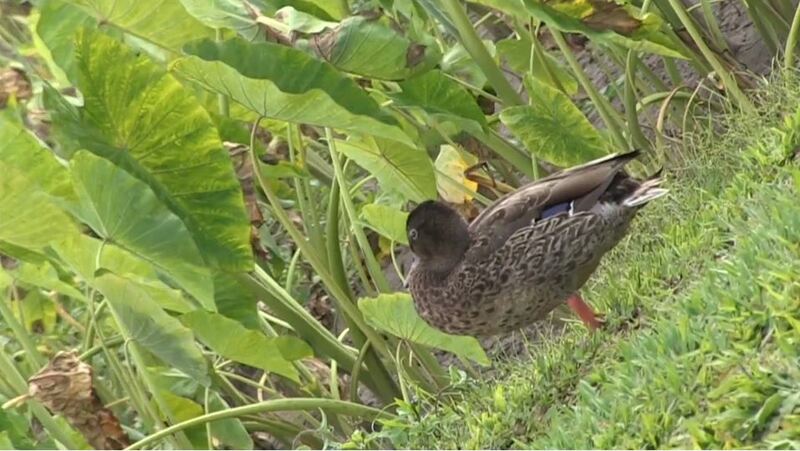 Fish and Wildlife Service have recommended that removing feral mallard ducks is a critical step toward saving the Koloa from extinction. “The problem becomes distinguishing between Koloa, feral mallards and hybrids in the field,” according to Stephen Turnbull, Koloa Communications and Outreach Coordinator for DOFAW. “Though they look very similar to female mallards, with a trained eye you can detect some of their unique characteristics, and we’re working toward an identification key based upon genetic markers to further our conservation efforts,” Turnbull explained.